When you need secure tarpaulin seams for your trucks and other applications, finding the right equipment is critical. You might realize that relying on sewn seams to keep your truck tarps locked down may not the best approach. For the best results, you will want to look at hot seam tarpaulin welders that create a reliable bond for your tarps and you’ll know you can count on it day after day for all of your business applications. We can offer industry-leading tarpaulin welders that are durable, reliable, and effective. Contact us directly today so we can learn more about your specific equipment needs and provide a lasting solution. If you have struggled to find the right tarpaulin welder for your needs, consider a quality Radio Frequency bar welder. Businesses throughout the country look to RF bar welders when they need a reliable tarpaulin sealing machine. This form of industrial tarp welder equipment operates similar to your microwave. However, instead of heating water or food, an RF bar welding machine heats a metal bar and the fabric of your tarp through exciting the molecules within with radio waves. This excitation gives those molecules a negative electrical charge thousands of times per second, creating intense heat friction that allows the bar to apply pressure and create an incredibly tight seal. This bonds your tarp’s fabric as tightly, or more tightly, than if you had sewn it down — just much quicker and efficient. Why choose RF Bar Welders over other industrial tarp welding equipment? We think you will find that RF bar welders have numerous advantages. Other tarpaulin heat welders may damage your tarp plastic. However, most tarps and liners are fairly resistant to RF heating damage, meaning you are more likely to get a clean seal. We can also apply a coating of polytetrafluoroethylene (PTFE) to the bar surface to make sure the plastic does not adhere to it. RF bar welding is a more eco-friendly approach to tarpaulin sealing as the heating and sealing process does not generate any toxic smoke. In the end, many businesses prefer using the RF bar welder as their tarpaulin welding machine because the end product looks and feels smooth, streamlined and high-quality. 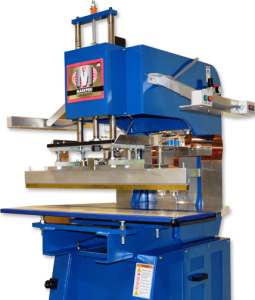 Why Choose MarkPeri as Your Tarp Seam Sealer Equipment Provider? If you are interested in an RF bar welder for your tarpaulin welding machine needs, we have a wide variety of affordable and effective RF bar welder options to choose from at 3KRF, a division of MarkPeri International. Why us? We have been in the RF welding business for over 35 years, providing the highest quality machines when it comes to RF sealing equipment and systems. We have a range of machines to meet both your budget and your goals for your business. We believe our combination of experience, flexible solutions and commitment to customer satisfaction is the key to our success and is why you will want to work with us now and in the future for your RF welding applications. For more information on finding the right tarpaulin sealing machine for your business, contact us now.